** Note - we are frequently asked what the difference is between the ResMed S8 Elite II and the S8 Escape II models. They are essentially identical machines, except that the Elite II records detailed data pertaining to the patient's breathing patterns, pressures and leakage rates, whereas the Escape only records usage and compliance data. Both machines now offer EPR, which offers some "softening" of the pressure when the patient begins to exhale. ResMed has made some key design changes to their already excellent S8 platform of CPAP machines to make them even better. First, they developed a unique low-inertia, dual-stage motor that rotates at much lower speeds than motors in traditional CPAP devices. Being dual-stage allows it to perform more efficiently at the lower speeds, resulting in exceptionally low noise levels of 26 dB. This revolutionary motor is also encapsulated in a protective silicon envelope that partially inflates with air and further isolates the unit from shock and vibration. 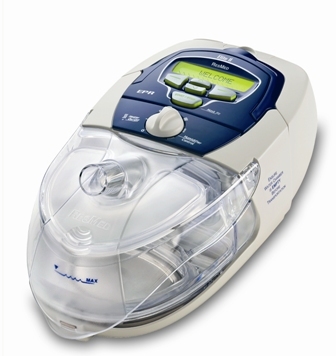 ResMed wraps it up in a durable thermoplastic housing for additional protection and sound-deadening. This produces a machine that is noticeably quieter than its competitors.